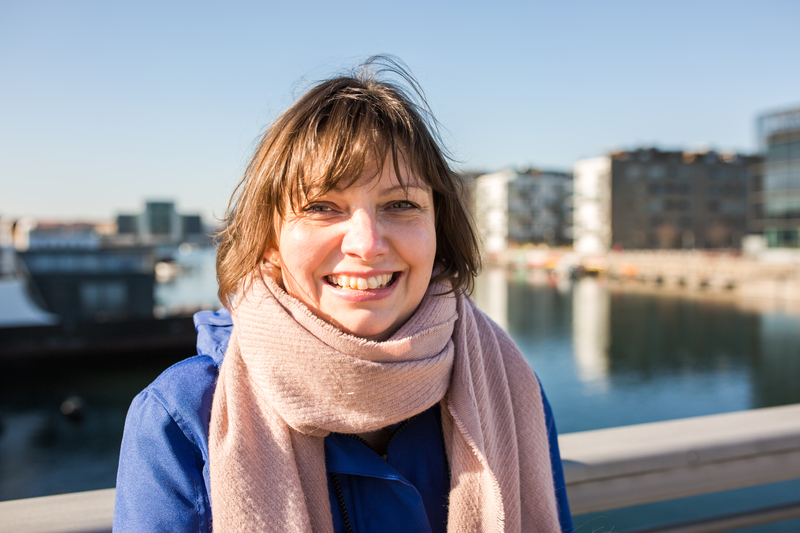 Recently my friend Tina wrote about how children here in Denmark swear in English (both the F and the S word) a lot and that it is commonplace as it has less meaning as it is a foreign word but is inappropriate to native English speakers (read her post here). However the use of English swear words so casually in the media and other areas of public life in Denmark and also in Germany really bothers me. I am no prude and I get that the Danes have a more relaxed attitude the many things and that has rubbed off a little on me. I was surprised that a friend for the UK was shocked by the black and white naked woman advertising the What’s Happening exhibition at the SMK (which incidentally ends of August 2) and also by the retro bikini pictures on Hansens Is postcards and thought these were inappropriate for her children to see. Neither of these things bother me for my son. I do however cringe when I read the media here and see the frequent use of words like bullsh*t and sh*tstorm (a term I think has been invented by the European media as I have never heard it anywhere else). I doubt you would see these words in the mainstream media in the UK or the US. 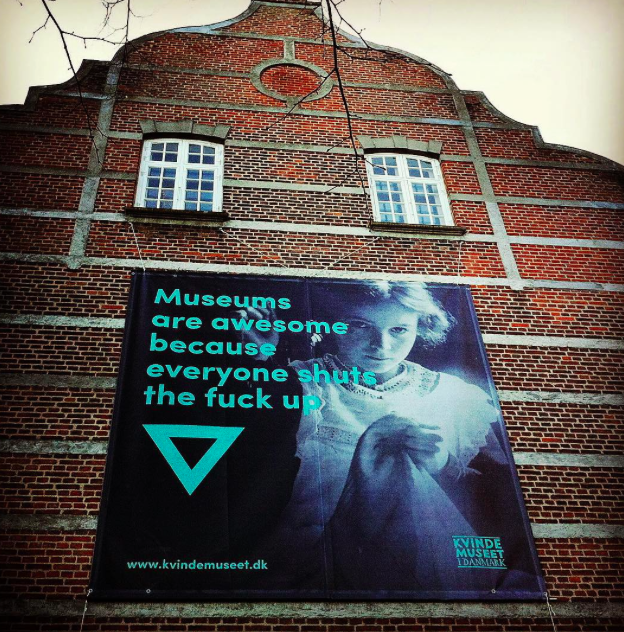 Last week someone shared an advertising poster from last year for the Kvindemuseet (Women’s Museum) in Århus which used the slogan “Museums are awesome because everyone shuts the f*ck up”. Ignoring the fact that museums should be lively places but I cannot understand the thinking behind it. Is it to shock and get people talking? Do they think its funny? Or do they think that the F word is a mild swear word and the use of it is normalised now? Either way it is a strange and mildly offensive poster especially as they are a ‘state recognized national specialist museum with the purpose of researching, building collections and presenting knowledge of women’s lives and work in Danish culture-history. Over the years the Women’s Museum has produced a long line of special exhibitions dealing with both historical and topical themes – culture-historical exhibitions and art exhibitions.’ I am clueless as to what relevance the poster has but maybe I am missing the point? Perhaps someone from the PR department of the museum would like to leave a comment? I am not as fanatical as some Americans about the F bomb as they call it but I would love to see the Danes, especially the media and cultural institutions, stop using such strong swear words so casually in everyday life. Photo shared by Scandi Kitchen on their Instagram feed. I agree Melanie, I think it is unnecessary. I agree as well! I think it is extremely unprofessional when colleagues or politicians here swear in conversations. I’ve been working on my husband to quit using swear words as well. I always say, there are other words people can use to express themselves! I’m not a Dane, neither native English speaker. I swear a lot in my own language but when I use English, swear words don’t kind of fit in the language that well. I think that Danes mix Danish and English happily and unconsciously. I have many times had a conversation with a Dane where I speak English and they speak both, they kind of forget that they were talking English or that the other one might not undertsand English. They always try the word they can’t remember in English in Danish and sometimes blame me as a non English person for not understanding English, when the word is clearly a Danish or French word. All and all I think they are just so confortable with mixing languages that they don’t care if they change the Danish swear word in English with the result that there are many swear words in their output. I agree too but when you consider that a large proportion of Danes exposure to the English language is through American movies then its no surprise that they consider those words everyday words. Karen, I don’t know what country you are from but that is certainly the attitude of my friends and family in England. If you use swear words frequently then you are perceived as a little stupid because you don’t have the vocabulary to express yourself intelligently. I have just come back from my fifth trip to Europe. I’ve been to Ireland, England, Scotland, France, Italy, Norway, Denmark and Sweden in my travels. I think Americans are pricklier about behavior and language than any Europeans. In the end it is only words. I grew up in New York City and lots of peoplle swear in New York. In the end i do not give damn about if people swear or not..
hm. I think yes, they use “f*ck” a lot and also I started to and when I am with native english people, they seem to be little.. surprised that I swear so much. But bullsh*t and sh*tstorm? I think english has beome so common to use, it doesnt mean such a strong expression as maybe used to.. I dont know.. I wouldn want my kids maybe to say it all the time, but it is not THAT bad as you picture it I think. Children in the USA would *never* use those curse words, it is seen as wildly inappropriate. And definitely also inappropriate for *any* adult in the vicinity of a child to curse. I think Danes watch American TV/movies and try to emulate the dramatized language without understanding the context. And if a child/adult cursed the way Danes do, they would be seen as though there was something wrong with them, mentally or otherwise. I’ll preface this with saying that I’m not working for Kvindemuseet, but I know it, and other museums in a professional context. Also, I’m from Denmark. By ‘they’, do you mean Danes in general, or the museum? No matter which ”they’ you’re talking about, the answer is probably a little bit of both. This particular museum has been trying hard to shake off their old fashioned1970s-style feminist image, and they’re probably trying to be a bit edgy while also making fun of some stereotypes about museums in general. It’s supposed to be mildly sarcastic. At least that’s the way I read it. I agree completely with this comment. I am a native english speaker and have undoubtedly benefitted from the fact that the language has become an international communications tool. My grandparents were not english speakers, so already the language for me is something disconnected from my family’s heritage or culture. I guess with this comes the understanding or recognition that there will be many different uses and adaptations of the language according to different cultural norms and contexts. I love that Danes have taken the language to suit their needs and with this comes a cultural reworking of the language. So while my ears turned red when I first heard the f-word used in a work meeting, I have relaxed about it since then. Now, if I could just wrap my head around all of the different danish swear words! A few years ago we had a Danish school child staying with us, she was around 16 years old. Her language was appalling and I frequently had to remind her that it was inappropriate in school, church, shops etc and in front of adults she didn’t know. She thought I was very fussy and felt that she was being picked on. I dread to think how she will fare at work.